Perfect for casual dining and entertaining, Libbey's combo set of 12 stemless wine glasses feature a sophisticated, upscale curved design that feels comfortable to hold. Durable and chip resistant, these red wine and white wine glasses provide an instant, effortless upgrade to your drinkware collection. This set includes six 16.75-ounce red wine glasses and six 17-ounce white wine glasses. 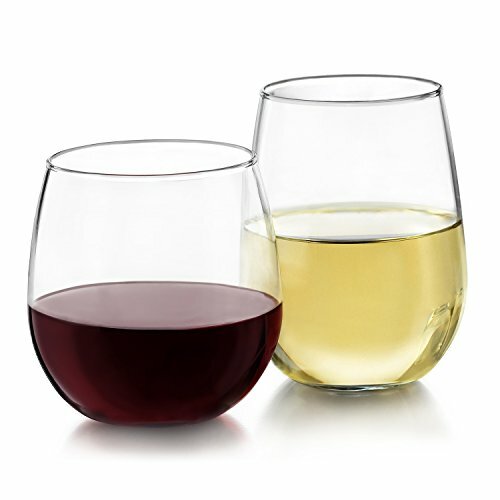 Offering more than just a trendy, modern design, Libbey's stemless wine glasses feature a wide bowl for the red wine glass and a slender profile for the white wine glass — each providing the perfect showcase for any varietal's flavors and aromas. They're a great match for any wine you plan on pouring, from Cabernet Sauvignon, Merlot, Shiraz, and Zinfandel to Chardonnay, Riesling, Pinot Grigio, and Sauvignon Blanc. These versatile glasses can also be used for serving chilled water, cocktails, and more. Bring them home for yourself, or present as a gift at weddings, birthdays, anniversaries, or any celebration. Both glasses feature a stable, ergonomic, and balanced base, which helps minimize the chance of tipping or breaking. And because of their stemless design, these glasses help save space in the cabinet. The red wine glass measures 3.875 inches tall and 3.875 inches round, and the white wine glass measures 4.5 inches tall and 3.5 inches round. Dishwasher safe for quick, easy cleanup. Made lead-free in the USA.